I did all the UX, UI, and interaction schemas for the project. Ben Norskov and I teamed up with photographers, CJ Clarke, Jen Tse, Daniel Sircar, Gabriella Demczuk to build an interactive experience that would showcase the complex tableau of social & economic hardship that communities struggle with in Baltimore. 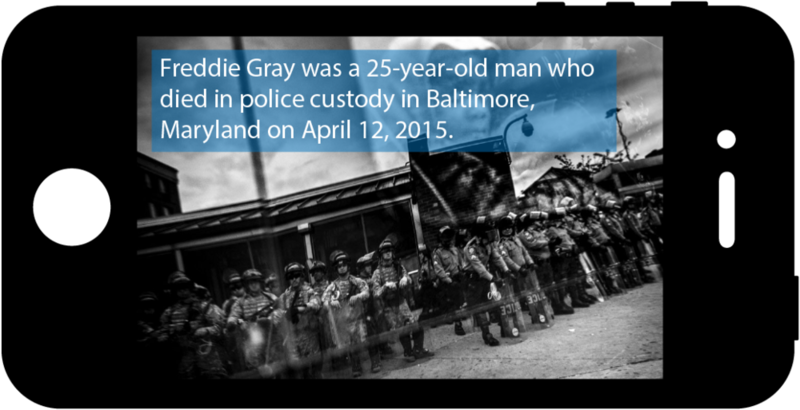 Baltimore Sings the Blues won the Technical Prize at the ICP “Hack The Photo” Hackathon in 2015. Playing with the idea of showing social complexity through the images and text, we wanted to reinvent the photoessay using cutting edge web standards and interaction design. Using Baltimore native Gabriella’s images to build visual narrative for the tragedy of social negligence and marginalization that came to a head with Freddy Grey’s murder. Mockups showing a sequential flow for the actual experience.